Recycled bits of metal, artfully put together, celebrate peaceful moments reading with man's best friend. Whether spent lost in a novel or catching up on sports news, peaceful moments reading outdoors spell contentment. Add a beloved four-legged companion (who can't talk!) and you've upgraded to pure bliss. Celebrating the simple pleasures of man, dog, and words, together under a tranquil sun, this inventive piece of art makes a sweet gift for the retiree or me-time expert. 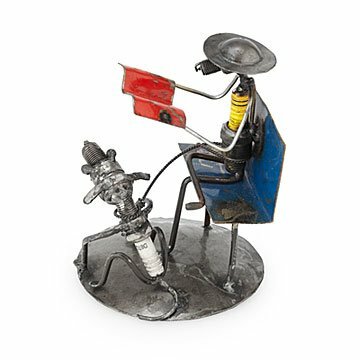 Artisans in Ouagadougou, Burkina Faso, fashion this whimsical mini-sculpture from recycled spark plugs and scrap metal that would otherwise go into a landfill.